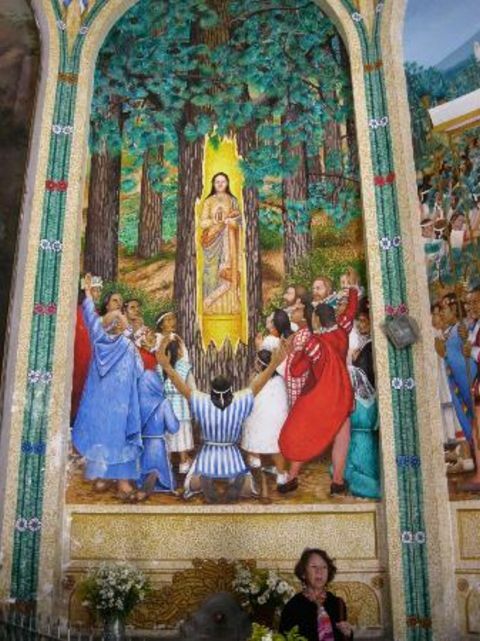 Just ten years after Juan Diego was given the miraculous image of Our Lady of Guadalupe, another Juan Diego in Tlaxcala, Mexico had a similar experience. His full name was Juan Diego Bernardino. Tlaxcala, once the most populous and largest city in the country, was suffering an epidemic of smallpox. Estimates claim that nine out of every ten Indians died as a result of the infection. Juan emptied his jug of the river water and filled it with the clear water of the spring. Wanting to express his gratitude, he turned to the Lady, who then entrusted him with a message for the Franciscans at the Monastery of San Lorenzo where Juan was employed. “Tell the religious for me that in this place they will find my image. It will not only manifest my perfections, but through it I shall generously bestow favors and kindness. When the Lady disappeared among the trees, Juan hurried to the village with his precious water. Upon reaching the bedside of his afflicted relatives, he told them about the Lady and the miraculous spring, as well as her promise of health through use of the water. Juan watched in amazement as the Lady’s word was realized when each was restored to health after drinking the miraculous water. The next day, Juan returned to the monastery and told the friars of his experience. After questioning him during the day, they decided that his story had merit and planned on visiting the place with Juan at night so as to avoid the curious. Before reaching the place, they noticed a glow in the distance, and when they arrived, the grove of ocote trees was on fire. The largest tree in the grove – and ONLY this one – was burning along its entire length. Since nothing could be done, they left, but planned on returning after Holy Mass the next morning. With the addition of some of the parishioners, they set out and found a puzzling situation. The fire had destroyed only the lower branches of the surrounding trees. The tallest tree, which had burned its entire length, was indeed blackened. Why the dry summer heat had not destroyed the other trees in a similar manner remained a mystery. Thus, the tale of Juan Diego Bernardino was fully verified in the presence of many witnesses. 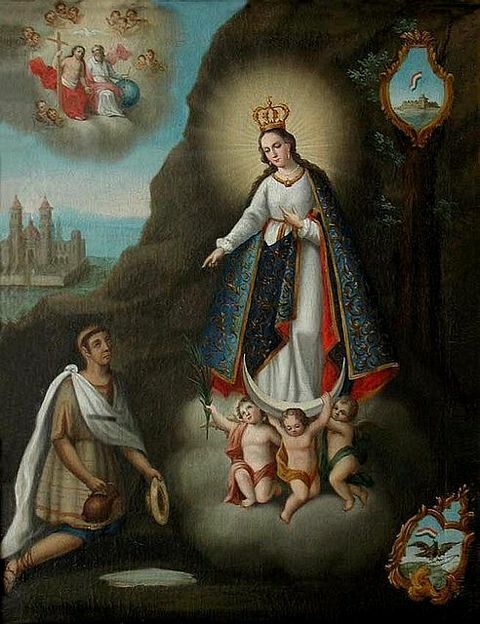 They agreed that the apparition of the Virgin Mary to her servant Juan Diego was a happy reality on the day that she showed him the medicinal water and sent him to advise the religious where they would find her sacred image. With the singing of hymns, the statue was brought to the chapel in a grand procession. The abbot removed the present statue of San Lorenzo and replaced it with the miraculous image of the Mother of God. The Indian sacristan resented the removal of the statue of San Lorenzo and secretly transferred Our Lady’s statue to another location in the middle of the night. But, the next morning, the statue of the Virgin Mary was found back on the altar where the abbot had originally placed it. Determined to not be stopped, the sacristan again removed the statue of Mary the next night – and actually took it home with him. But to his shock, the statue disappeared from his home and reappeared back on the altar in the church by the next morning. Stubbornly, the sacristan was even more determined to stop this mischief. On a third night, he hid the statue of Mary at the church in a cabinet with vestments – and then slept in front of it in order to catch the mischievous ones! Once again, the beautiful God-given image of Our Lady escaped through supernatural means and appeared back on the altar where Blessed Mary had desired it to be placed. The sacristan was now convinced that Our Lady’s wish to be placed on the altar should be respected. 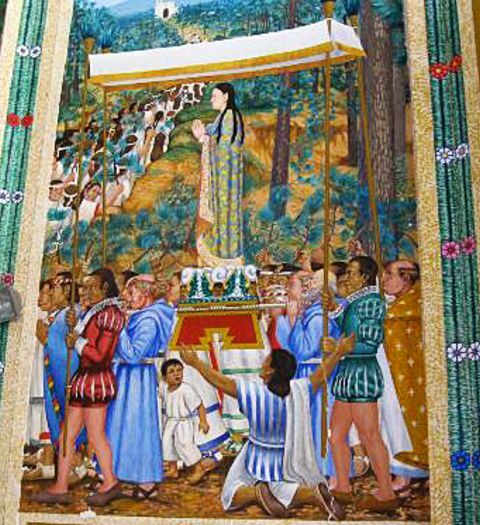 Today, the original 58-inch tall statue of Our Lady is now found in a magnificent niche or Camarin above and behind the altar in the Basilica of the Virgin of Ocotlan. From the earliest days the statue was called Nuestra Senora de Ocatlatia – which means Our Lady of the Burning Ocote (tree). 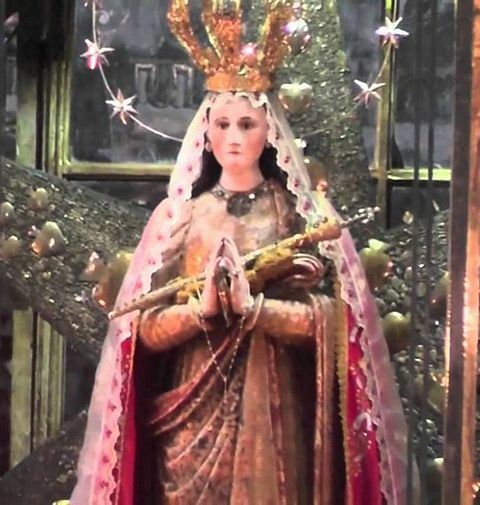 Now, it is simply called Our Lady of Ocotlan – Ocotlan being the Nahuatl word for “place of the pine tree.” The beautiful statue of Our Lady is always dressed in costly vestments. She wears a splendid golden crown which is surrounded by a halo of stars. The crown represents Our Lady’s coronation by the pope in the year 1906. Among the persons of distinction who visited the miraculous statue was the Archbishop of Puebla, Juan de Palafox y Mendoza, who visited it in 1644, and Archbishop Diego de Osoria de Escobar, who honored the statue in 1670. Additionally, the shrine of Our Lady was recognized by Pope Clement XII – who authorized a feast day for Our Lady of Ocotlan, and Benedict XIV — who raised the shrine to the status of a basilica and granted indulgences and Apostolic indults to the faithful who venerate the image. Other popes who also recognized the apparition were Pius VI, Pius X, and Pius XII. 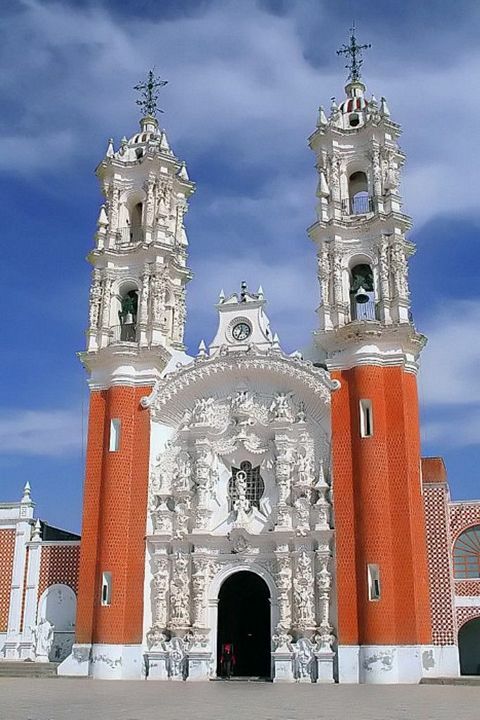 One of the most beautiful churches in Mexico enshrines the statue of Our Lady of Ocotlan. Also of interest to visiting pilgrims is the place of the miraculous spring and the small chapel that stands in the ancient ocote grove where Our Lady appeared to Juan Diego Bernardino.